Where else will you get a backdrop for your big day like in New York? 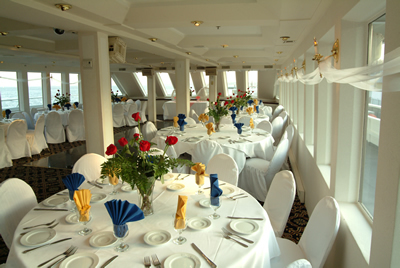 We have yachts available with large observation decks and dining halls with floor to ceiling windows. Aboard you and your guests will have romantic 360 panoramic views of the city that can’t be found anywhere else. 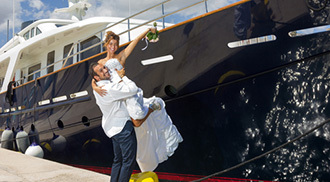 Not only do you get married aboard a beautiful luxury yacht but we also have event planning and catering services available as well. We’re here to make your event the day of your dreams and wish to exceed your expectations. What better way to say “I do” then to indulge you and your guests in style! Dance the night away next to the Statue of Liberty or under the Williamsburg Bridge. Whether you’re from New York or having a destination wedding this will make your event unforgettable. If you’re interested in booking a New York charter yacht for your next event please contact us here. We look forward to helping you plan your big day! This entry was posted on Friday, August 12th, 2016 at 4:27 am and is filed under News & Events. You can follow any responses to this entry through the RSS 2.0 feed.